When you are here on vacation and looking for a place to stay, you want the very best. That’s where Sleep Inn and Suites comes in. With their finest huge rooms, amazing views, prime location, and friendly staff, your stay in Page will be that much sweeter when you stay at the Sleep Inn and Suites. As one of the newest hotels in Page, you can rest assured that everything there is clean, comfortable, and ready to go. Be Sure to enjoy their complimentary breakfast. Sleep Inn and Suites has 98 guest rooms, each one designed to optimize your comfort and give you the feeling of staying with the finest. Each room features refrigerators, LCD televisions, and luxurious pillowtop beds. Their prime location means that you could have a balcony with a gorgeous view of the dam, look out at the stars at night, take advantage of the nearby golf course for a relaxing round, or enjoy a short morning walk right to the Colorado river. 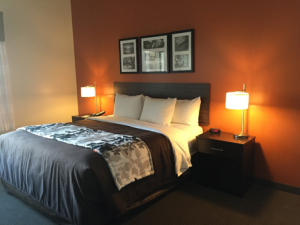 You’ll sleep easy at Sleep Inn and Suites! Each hotel comes with its own set of amenities, and Sleep Inn and Suites is no exception — they strive to provide you with the best stay possible, which is made clear by the number of extras they happily provide! 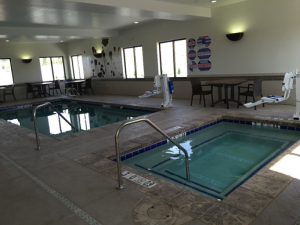 Enjoy a business center, an indoor pool, a spa tub, a fitness center, free full hot breakfast, free wi-fi, free local calls, laundry facilities, and more. 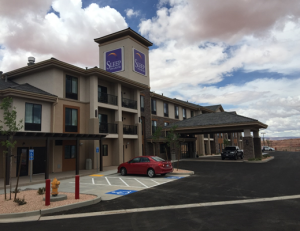 At Sleep Inn and Suites, you will find the highest quality rooms, the friendliest staff, and the best amenities in Page. Booking your stay while you are in Page will be the icing on the cake of your fantastic vacation here, so call for your reservation today!